When we think of women in sports, we see Serena Williams, Billie Jean King, and Danica Patrick. But there is one female athlete who’s story has never put in the spotlight, and she is Manon Rheaume. Rheaume is the first and only female hockey player to play goalie in the NHL and for a pro sports franchise in North America. 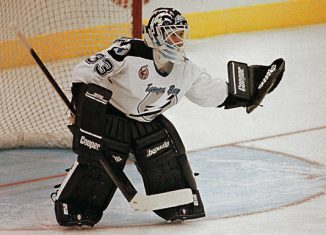 Rheaume’s stint with the NHL only lasted two preseason games in 1992 and 1993 with the Tampa Bay Lighting, in which one game she only allowed two goals out of nine shots on goal and played in the minor league hockey system according to NHL.com. In 1998, she won the silver medal in the Nagano Olympics for team Canada, and she also went on to gold medals for 1992 and 1994 IIHF world championships. Hockey runs in Rheaume’s family. Her Brother Pascal, played professional hockey in the AHL and NHL from 1993-2010, and winning the Stanley Cup with the New Jersey Devils in 2003. Rheaume’s story is an incredible story, because she was the first female athlete to play professional hockey and assume the role of goaltender for only a short time. No one would have ever thought a native of Lac Beauport, Quebec, would ever be the first female to enter a male dominated sport, and set an example for young women to play hockey. Today Rheaume has a foundation to help young girls achieve their dreams that she had when playing hockey as a child. As kids we used to be like mike, but know inspiring young female athletes can say be like Rheaume.